By Monique Tyminski, D.O. and Hartley Sirkis, M.D. A 31-year-old man presented with a 4-week history of a palpable left thigh mass and anterolateral left thigh pain. Initial radiographs (not shown) were unremarkable. He was referred for an MRI (Fig. 1) which revealed a mass within the vastus lateralis. Ultrasound examination (Fig. 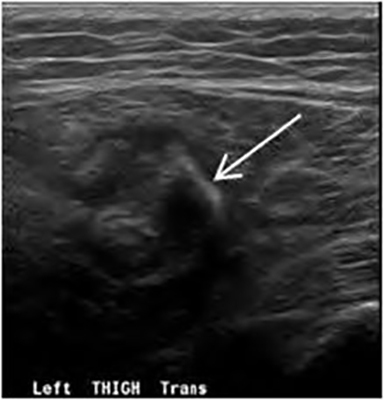 2) showed a heterogeneous intramuscular lesion within the vastus lateralis with an incomplete peripheral echogenic, shadowing calcified rim. No central calcifications were present. Increased peripheral color flow was present with no abnormal flow in the central portion of the mass (not shown). Repeat left femur radiographs (not shown) again demonstrated no calcifications. 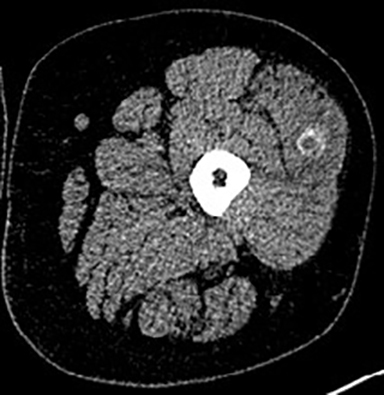 A non-contrast CT (Fig. 3) performed the same day showed an amorphous, peripheral, incomplete rim of calcification corresponding to the intramuscular lesion within the vastus lateralis. After consulting with the orthopedic surgeon, a decision was made to proceed with watchful waiting and follow-up. Repeat radiographs performed on follow-up 5 weeks later remained unremarkable. Clinically, the palpable mass had decreased in size and was no longer tender to palpation. Radiographs may appear normal or demonstrate a nonspecific round to oval juxta-articular soft tissue mass. Calcifications may be identified in up to 30% of cases, are of variable size and character, and are often eccentric or peripherally located within the mass.4 The appearance of synovial sarcoma on CT is frequently a heterogeneous soft tissue mass with attenuation similar to or slightly lower than that of muscle.4 The mass will not demonstrate mature peripheral ossification, as is typically seen with myositis ossificans. The differential diagnosis of a soft tissue mass with calcifications includes both benign and malignant etiologies which often have overlapping imaging characteristics. When present, however, a mineralization pattern of a peripheral rim of mature, lamellar bone with a non-ossified central component on CT is suggestive of myositis ossificans. The MRI appearance is less specific with a similar appearance to malignant lesions. Since myositis ossificans may mimic aggressive sarcomas on histological examination, biopsy should be deferred for follow-up imaging in cases where myositis ossificans is suspected. This case demonstrates the progression and appearance of myositis ossificans and its unique imaging characteristics that should be recognized in order to avoid biopsy and potential misdiagnosis. Careful follow-up is an essential part of establishing a definitive diagnosis and guiding clinical management. Kransdorf M, Meis J. Extraskeletal Osseous and Cartilaginous Tumors of the Extremities. Radiographics 1993;13:853-884. Brant W, Helms C. Skeletal “Don’t Touch” Lesions. Fundamentals of Diagnostic Radiology. 4th edition. Philadelphia:Lipppincott Williams & Wilkins; 2012:1078. McAuley G, Jogannathan J, O’Regan K, et al. Extraskeletal Osteosarcoma: Spectrum of Imaging Findings. AJR 2012;198:W31-W37. Murphey MD, Gibson MS, Jennings BT, et al. Imaging of Synovial Sarcoma with Radiologic-Pathologic Correlation. Radiographics 2006;26:1543-1565. 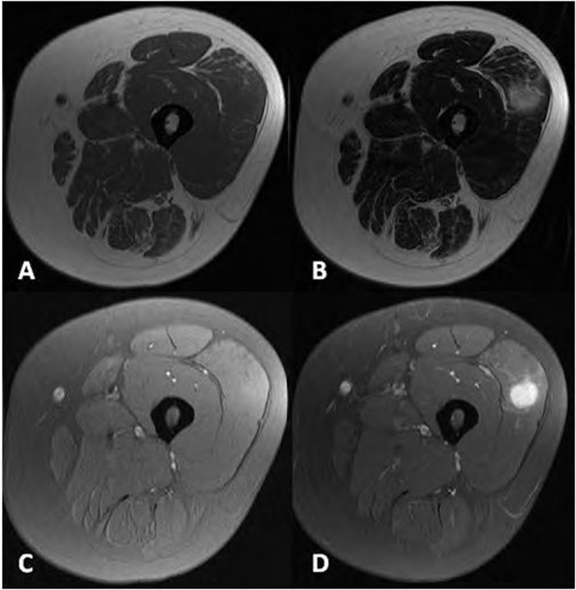 Tyminski M, Sirkis H. Calcified Thigh Mass. J Am Osteopath Coll Radiol. 2013;2(4):29-31. Monique Tyminski, D.O. and Hartley Sirkis, M.D. Dr. Tyminski works in the Department of Radiology and Dr. Sirkis works in the Division of Musculoskeletal Imaging both at UMass Memorial Medical Center, Worcester, MA.